Dentists can replace a tooth very quickly by fabricating a single tooth budget denture – nb more teeth can be put on a denture if more teeth are missing. This kind of denture is much like an orthodontic retainer with one or two teeth; it may have a couple of wire clips that hold it onto other teeth. 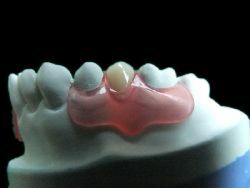 These types of denture are mostly easy to wear and care for, and they repair the patient’s appearance. 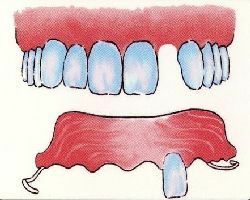 Most people are not happy with their ability to chew with this type of denture in place, so they remove it when eating. Some have trouble talking with the denture at first, but speech improves with practice. This is the least expensive way to replace a tooth. Some patients will live with a denture like this for years before replacing it with a more permanent false tooth such as a bridge or dental implant or a more precisely fitting denture. Another bridge option is a Maryland bridge. This is the least expensive type of bridge. 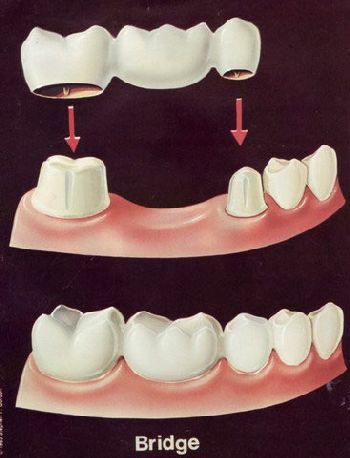 These bridges are bonded to the adjacent teeth with metal wings that attach on the inside surface of the tooth ie you generally can’t see the metal wings. These bridges do not tend to last as long as a “conventional” bridge & there is a cost involved in recementing them periodically. Implants can provide you with increased confidence and freedom by restoring that gap in your smile or that denture which is always moving or difficult to eat with. In many cases dental implant teeth can be made to look and feel like your own teeth. With the correct maintenance program & when conditions are right dental implants can last a lifetime. On-going studies show that dental implant placements generally exhibit predictable and excellent success rates. 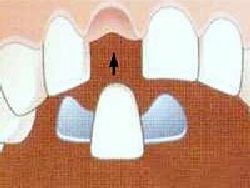 No teeth on either side of the missing tooth are touched. Implants can also span a wider gap replacing multiple teeth.